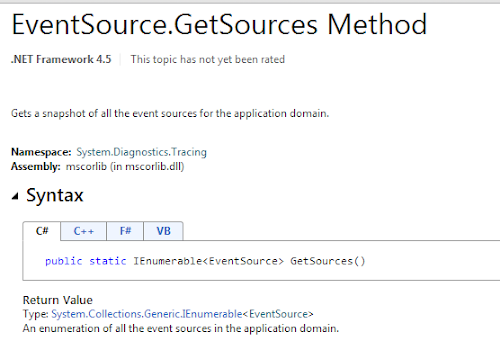 .net framework 4.5 introduced EventSource API to write events using ETW infrastructure. The choice of ETW infrastructure has made the writing of events lightning fast. Now they can be consumed by any ETW consumer. If the event provider is not enabled, then the events just fall on the floor. On the other hand, if a session is already established, they are written to ETW session buffers. Now they can be consumed by the consumers. The event provider (EventSource) doesn't really have to wait until the messages are consumed. This is independent on the number of consumers registered for a particular type of events. We have discussed about ETW tools and their usage with EventSource API [Reference]. 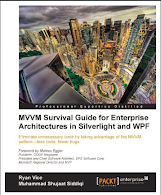 As we discussed above, the choice of ETW infrastructure has made EventSource API extremely fast. But we can even improve on it further. But remember that these recommendations would be useful in the case for high volume events generally. For low frequency events, although you would have performance improvement, but this might not be very noticeable. ETW controllers can enable a provider before registration of provider. So when a provider registers itself and starts emitting events, a session is automatically created and they are forwarded to the buffer. In order to prove that, we can start Semantic Logging Service (from Application Block) and then run our application. Our service should still be able to consume the events. 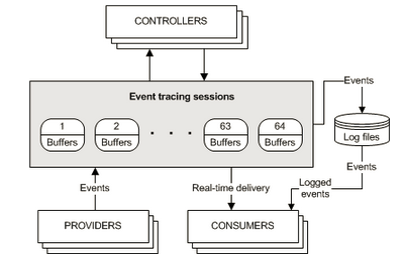 On the other hand, if the provider is not enabled, the events just fall on the floor by the ETW infrastructure. In order to improve it, we can check if the event provider is enabled so that we don't even use the WriteEvent() definition in base class. It does check the same thing in the base class as well. When an Event Provider is enabled (generated for EventSource), it receives a command to enable itself. We can even use this command in our custom EventSource by overriding OnEventCommand() method. You don't need to use the definition of base class method as there is an empty implementation of the virtual method. It caches this in a local variable. So EventSource can use this field to check if it is enabled. 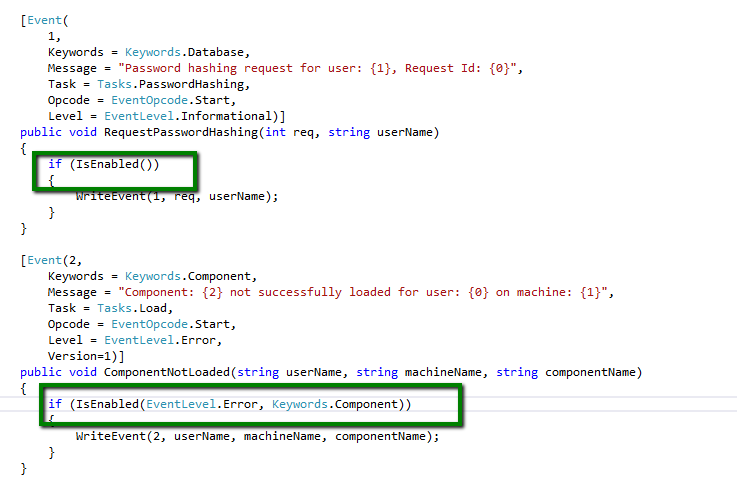 There is no property available in EventSource type to check that but we can find IsEnabled() method to do just that. Now a method might cause some confusion for you thinking it might be slow as it might do some other stuff and could slow it down further. As the development team suggests, it is just a field fetch. We can also verify this by dotPeeking into the framework assembly from Windows folder. As a matter of fact there are two overloads of the method. One of these overloads is parameter less. The other one is more interesting, it lets us check if the provider is enabled for a particular level and keyword, which makes it more interesting. As we know static variable fetch is more expensive than an instance member fetch, we can assign the singleton instance to a local instance member. 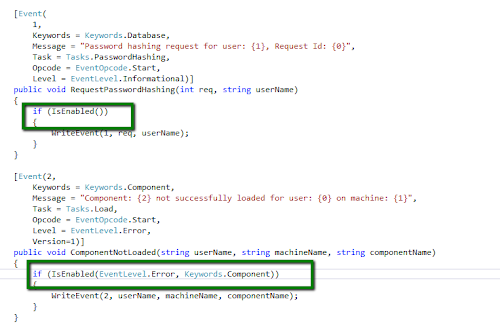 In order to improve the usage of EventSource's method, we can assign this to a local variable. Then we can use the local member at the logging site. In a previous post, we discussed about the mapping between EventSource and ETW Event providers. 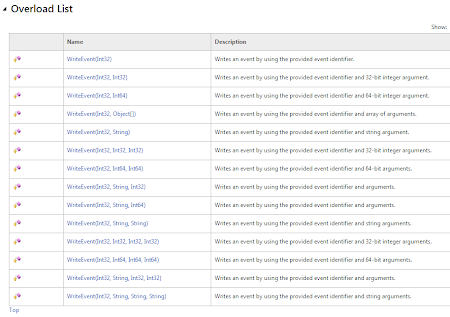 Actually the framework registers an Event Provider in ETW infrastructure for every EventSource in the application. This is done using ETW EventRegister API. This allows the framework to pass a command to the EventSource from external controllers. The framework also maintains a list of EventSources in the application domain. We can get the list of all EventSource (s) in the application domain using the static GetSources() method in EventSource type. Both of these tasks are performed at startup. Since this would depend on the number of EventSource (s) in the applications so the higher number for event sources in your application would mean slower startup. This can be resolved by minimizing the number of EventSource in your application. I would definitely not suggest an EventSource for each type in your application. There can be two options to resolve this. The first option is using Partial types. We can span the same type across different files in the same assembly. All of these definitions are combined to generate a consolidated type by the compiler. We generally organize our types in different folders in a project. Here each folder generally represents types belonging to the same group. We can provide all the event methods definition for the method group for the types in this folder. Most of the real life projects span more than one projects. In this case, we should still be able to minimize the number of EventSource (s), by defining on for each group, in order to improve the startup performance. Here each event source can take care of instrumentation requirement for a group of types in your application. You can group them logically or the way you want. 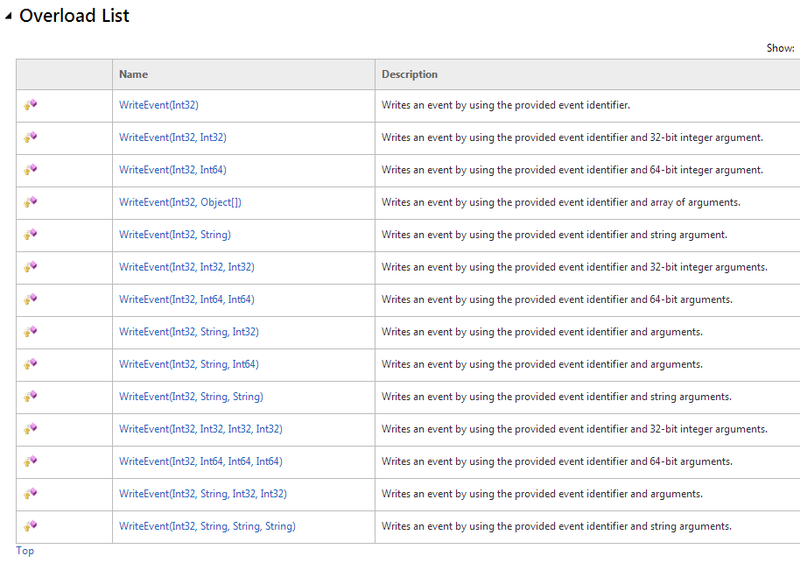 There are various overloads of WriteEvent() methods in EventSource type. 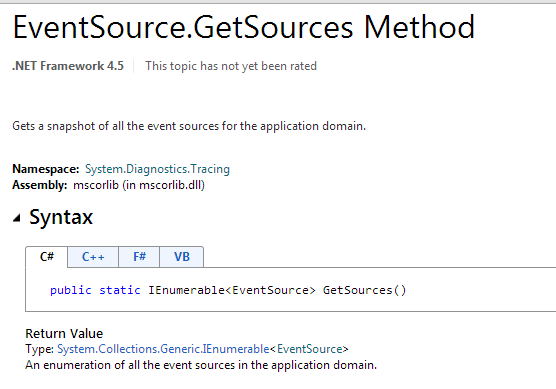 We need to call WriteEvent() method from our [Event] methods in EventSource type. One of these overloads is an overload with params array. If none of the overload matches your call then the compiler automatically falls back to this overload. We should be avoiding the fallback method as much as possible for performance reasons as it is reported to be 10-20 times more expensive. This is because the arguments need to cast to object, an array needs to be allocated and these casted arguments are added to the array. Then calling the methods with these arguments as serialized. In order to avoid using the fallback overload, we can introduce new WriteEvent() method by overriding it.